This is the first task that hasn’t really grabbed me. I decided to subscribe to my own blog, one by a presenter I like and Bright Ideas (SLAV) as my library blog. Instantly I had 21 unread posts. What a disaster. I already have mountains of unread email to deal with. I guess if I refined my list to just people I was really interested in it might become more useful. On a more positive note I did like the way it aggregated all the posts so I didn’t have to swish about the net looking for my information. This is a truly amazing site. I added three books I already owned and it suggested other books I might also like. I was straight off to the dymocks site to buy them. Check back later to see how they rate. Gunbower Island, originally uploaded by seriata1. 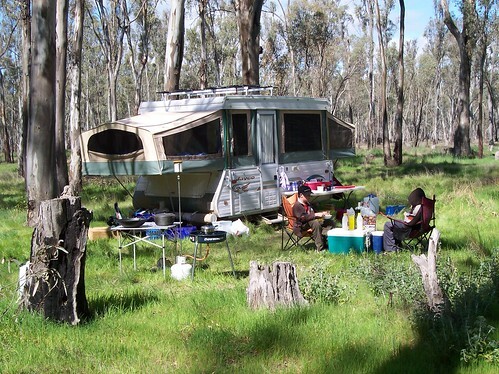 Here we are camping at Gunbower Island. I’ve dabbled a little before (wikis and facebook) but I’ve decided it’s time I made a concerted effort to keep up with the kids.